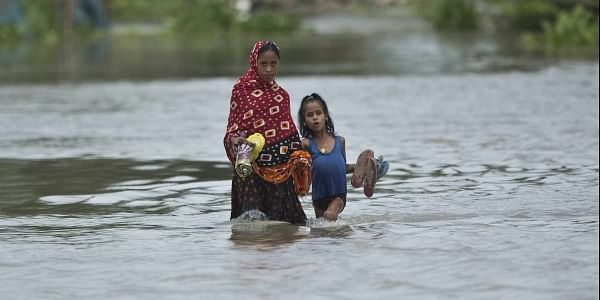 Over 68,000 people were affected by deluge in Dhemaji, Lakhimpur, Biswanath, Charaideo, Cachar, Karimganj and Hailakandi districts, according to the Assam State Disaster Management Authority. NEW DELHI: Home Minister Rajnath Singh today spoke to Assam Chief Minister Sarbananda Sonowal and took stock of the flood situation in the state, besides assuring him of all central help, officials said. During a telephonic conversation with Sonowal, the Union minister reviewed the situation in Assam where large areas are inundated by flood waters. Singh told the chief minister that all possible support is being provided to Assam and other northeastern states for overcoming the flood situation, a Home Ministry official said. In seven district's of the state, more than 30 people lost their lives in the floods. Over 68,000 people were affected by deluge in Dhemaji, Lakhimpur, Biswanath, Charaideo, Cachar, Karimganj and Hailakandi districts, according to the Assam State Disaster Management Authority (ASDMA). Karimganj is the worst-affected district with nearly 44,000 people hit by the current wave of floods, followed by Hailakandi with around 10,000 affected people. The much-awaited publication of the final draft of the National Register of Citizens (NRC), a list of state's citizens, on June 30 has been deferred due to floods in the state. In Arunachal Pradesh, four personnel of the Indo Tibetan Border Police were crushed to death on Friday when a huge boulder, loosened by monsoon rains, rolled down a mountain and hit their vehicle on the Basar-Akajan road in Lower Siang district. This was the second landslide-related incident in the state within a week. The toll due to landslides this monsoon in Arunachal Pradesh has risen to nine.